Amazing updates recently announced will transform how you work with two popular G Suites apps, Slides and Gmail. Let’s take a look at my favorite tool Slides to see some popular ways to record audio. One of the challenges is how to record audio and save it to Google Drive. In this blog entry, we’ll explore those approaches, as well as take a quick peek at Gmail’s upgraded features. We have listened to your requests and are adding audio files as additional media types in Slides. We know that adding audio clips can bring your presentations to the next level. If you look now (early April 2019), you may not see the option to Insert->Audio into a Slide. That’s because the rollout will not become visible until later this month (before April 18). On your computer, open a presentation in Google Slides. Select the slide that you want to add the audio file to. Choose an audio file and click select. Since you can insert audio files (MP3 or WAV) into Slides from Google Drive, how could you record and save to Drive? Here are two approaches using free apps for iOS and Android devices. In fact, I’ve used the Android app on Android-capable Chromebooks like the one I’m writing on to record. Voice Record Pro is a professional voice recorder. It allows you to record voice memos and on-site sounds. Recordings are at unlimited length with configurable quality. Voice Record Pro can record in…MP3 (MPEG) and WAV formats (source). Here’s a video tutorial from YouTube on how to record audio on Voice Record app and then save to Google Drive. 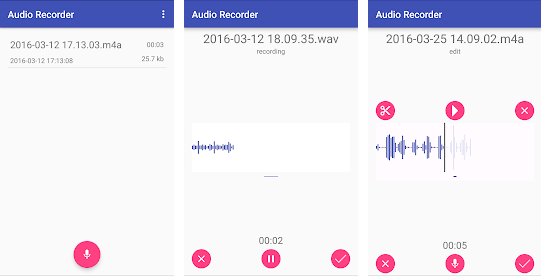 On Android, there are many apps titled Audio Recorder, so you will want to get this free Audio Recorder app from Axet. This app makes it easy to record to various audio formats, such as OGG, WAV, M4A, and MP3. Of the many formats available, MP3 and WAV are the two compatible with Google Slides. After recording, you can save the audio file in MP3 or WAV format to your favorite Google Drive folder. An added benefit of the Android app linked above is that it will work on Chromebooks that can run Android apps as shown below. You are able to save audio recordings to your Files on your Chromebook and then place them on Google Drive. Need “quick access to a range of help and support content?” Then Gmail, along with other apps, will soon enjoy a new support button next to the search bar at the top of Gmail. You may have missed Smart Compose and one more update. An additional update you may find useful (I do!) is the “Write now, Send Later” option. This makes it easy for you to compose an email at 1:00 am in the morning, and, rather than send out the email at that early hour, schedule your email for an 8:00 am delivery. Google often updates its apps. Keeping up with those updates may seem a Sisyphean task, but these updates can enhance your productivity and provide additional ways for your students to showcase their learning. Take advantage of them! I often think back to when I was teaching elementary school. Even though it was important for my students to do well in all subjects, it seemed that reading was the subject that held the key to all the others. Whatever I could do to help them learn to love reading, I was all-in for. For example, I worked hard to make sure that I had an extensive library of books for my kids to read, and regardless of how many years I read Old Yeller aloud, I always dreaded the ending. That is, I dreaded knowing I would cry as I read the ending, no matter how many times I read it. But I also knew that my students would cry as well — some of them always did, too — and that wasn’t necessarily a bad thing. There is something special that happens when you really get into a book and it make an emotional connection. For many of my students, those who lacked the joy of reading, it was my goal to take their reading to the next level. Not just in regards to the next Lexile level, but the next level in connecting reading to their heart. That’s exactly what the creators of Novel Effect hope to do. 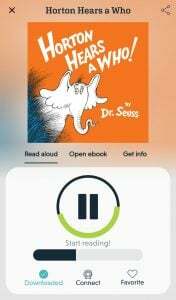 The free app for both Apple and Android allows you to read a book aloud while it provides special effects and relevant audio. Instead of speech-to-text, think of this as speech-to-sound effects. As you are reading out loud, the app listens and provides audio to enhance the reading. Leaves rustle, animals howl, and footsteps crackle as you tell your tale, adding life to every line and engaging your audience. Whether you are reading aloud to your class, a parent reading to his/her child, or a student reading aloud to his or herself or a small group, Novel Effect is a clever tool that follows your lead and makes reading (and listening) that much more fun. In the clip below, you can hear my rendition of Dr. Seuss’ Horton Hears A Who! 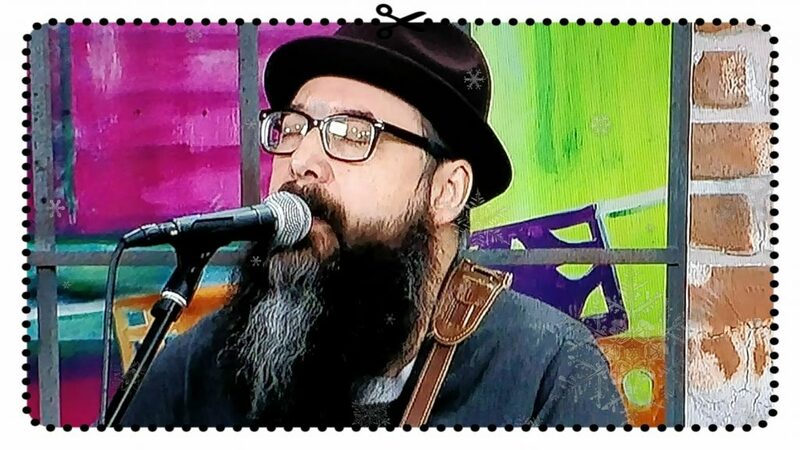 with the assistance of the Novel Effect app. 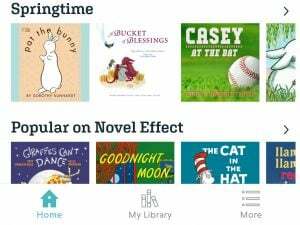 Novel Effect has a lot of books in their library already, so you’re likely to find one your students will enjoy. As you start reading, the app will begin following your voice and interact with you as you read. You can scroll through popular books (and even make recommendations if a book you love is not already included in the app) or search for books by grade level. Here are a few of my favorites included in each of the categories, with more being added. To start, have students locate a book to perform for the class, either individually or in pairs. It’s okay if the book is below the student’s reading level. Let this activity be about building fluency, using voice and inflection to add interest, and pacing. If you find that you don’t have time for every student or group to perform, consider having Flipgrid set up so that they can each record their performance. This allows students to find and enjoy stories that other students have performed. Then you can get really creative. After your students have had a chance to read with Novel Effect a few times, allow them to create their own set of sounds and music to go with a text of their choice. For this, you may prefer that they use a shorter text or one that would need fewer audio effects so that student don’t get bogged down. For free sound effects, consider using the following websites: Free Sound, Partners in Rhyme, Sound Bible, ZapSplat, and the BBC Sound Effects. Or, if you are really adventurous and want to create your own sound effects, then read Robbie Janney’s post on ShutterStock Blog. In it, he even provides some great video to get you started on your journey. What is your favorite book to read to with Novel Effect? How have you used it with your students? Share your thoughts in the comments below! Communication between parents and teachers is an essential ingredient that fuels the learning process for students. When parents and teachers keep each other in the loop, they can notify each other of achievements, behavioral problems, health issues, and more. Unfortunately, even the most well-intentioned students forget to pass on information to their parents. Or they might have difficulty remembering the correct details, meaning that parents ultimately get inaccurate messages. Sometimes, poor communication also means that kids miss out on opportunities. For example, parents may need to pay class trip fees by designated dates to reserve a student’s spot. Or a football coach may require that parents submit documentation of their kids receiving recent physical exams that confirm they’re eligible for the sport. The bottom line is that this element of the educational process is crucial. Parent-teacher communication apps help in all these situations and many others. Here are are a few you might want to consider. Talking Points is a communications app that attempts to break down language barriers between parents and teachers. These barriers can hinder efforts to give updates and ask questions. Teachers can input messages in English and have the app translate them into dozens of languages. Then, recipients who don’t speak English can reply in their native languages. Bloomz is a multi-functional messaging app that lets teachers do things like give parents classroom-related updates or send them reminders about things they need to do. There’s also a behavior-tracking section and ways for educators to show examples of the kinds of work students are doing during the school day. Also, when teachers send messages to parents, there’s no need for them to reveal personal details like email addresses. ParentSquare provides a secure way for parents and teachers to talk to each other about school happenings. Teachers can share calendar events or files, plus engage in private messages with their students’ parents. There’s also a parent directory that allows people to have their details either visible or hidden. It could help adults connect with each other and collectively propel the learning process at a school. This app is not exclusively for parents and teachers, but many of its features target those groups. Messages go to phones that have the app installed, which could be a student’s phone or one used by an authorized caregiver. These apps signal the end of lost notes written on paper and allow more clarification between a child’s educator and parents. As a result, there’s more time to focus on enrichment due to fewer communication challenges. This is a guest blog by Kayla Matthews. Kayla is a tech journalist and writer who has been featured in a number of publications. You can find more of her writing on her tech and productivity blog Productivity Bytes. Whether you are an Android lover or just an Android user, you will find this list of gift ideas will make you green with envy. So before you spend a lot of time driving around everywhere or searching all over the Internet for great ideas, scan these ideas to find ones that be perfect for that Android person in your life this holiday season! The Lenovo Smart Display is a great tool to make your home, office, or other room smart. Enjoy the built-in Google Assistant to enjoy your favorite music, control other smart devices you are connected to, and run routines that you have created. You can even use Google Duo to make voice and video calls to your other favorite Android friends. You can get this smart display in an 8-inch model or 10-inch model. I have the 8-inch model and find that it is great – not too big for the bedroom side table. If you want to spend less than the Lenovo Smart Display, consider getting a Google Home Hub. Smaller in size but still powerful, you will find that the Google Home Hub fits nicely in any room with its 7-inch display. I purchased one the other week to go in my kitchen and it’s been great. I have used it multiple times to pull up recipes and listen to music while in the kitchen. When I’m not using it, I set it to display favorite photos I have in my Google Photos folder…and since I shared the folder with my son, he can add his favorite photos and enjoy them in the mix while he is in the kitchen or just walking through. The Google Home Mini goes in any room to bring convenience and connection. Ask it questions, run routines that you create, play games, and more with Google Assistant. You will enjoy this small device so much that you will find that you may need more than one. I actually have five in my house. I purchased the first one myself, and received a free one when I purchased the Lenovo Smart Display and a second free one when I purchased the Google Home Hub…then I lost track what I got the others with. If you are watching holiday sales carefully, you are sure to find items that come with a free Google Home Mini. Even if Santa is not able to bring a smart display, then maybe you will get a smart outlet in your stocking. Smart outlets connect to your WiFi and allow you to control them through an app, Google Assistant, or Amazon Alexa. I found a pair online on sale the week before Thanksgiving for about $15, making them very reasonable. When not on sale, you may expect to pay twice that price or more for more functionality. These are great if you want to use with a lamp or other appliance where you can turn it on and off just by starting with, “Hey, Google….” Postscapes has compiled a list of recommended smart outlets to consider. If you have some extra money hidden away that is burning a hole in your pocket, then consider going all out for the Samsung UN43LS03NAFXZA Flat 43” LED 4K UHD The Frame Smart TV 2018. When not using it as a crisp, beautiful TV, it can display favorite artwork. For friends who aren’t familiar with the Frame Smart TV (yet), they will think you just have high-end digital artwork on display. It has a sensor that detects when you walk into the room, at which time it will display your favorites. It will set you back about $1,300, so make sure are prepared if you decide to get one. One of the powerful features of these devices (excluding the Frame Smart TV) is that you can connect them together in the Google Home app to play your favorite music on a particular designated set. I have done this so no matter where I am in the house, I have my favorite playlist, podcast, or other audio playing so I can hear. Creating routines will also help you feel like you are a tech genius even though it is very simple (but you don’t have to tell anyone that last part). For example, on my Lenovo Smart Display I created a routine so that when I say, “Hey, Google, it is time to go to bed,” my bedtime routine begins playing. That includes telling me the weather for tomorrow, asking what time I want the alarm to be set for (and then it sets it), turning off the bedroom lamp, adjusting the Nest thermostat, dropping the volume to 10%, and beginning to play a favorite playlist I have specified. Lots of stores will be competing for your dollars during the holidays, so watch for special discounts that may reward you with some extra tech for you or another Android-loving friend. You may be surprised how much you love it…so much so that your friends will be green with envy. Share with us in the comments what other devices, gadgets, and “stuff” make for great gifts for Android users. We’d love to hear! The holiday celebration of Halloween hasn’t changed much in the past 100 years. But now there is a new twist that can make the celebration even better. Check out the Nextdoor app. Normally used for neighborhood events, the app has added. a Treat Map. Simply sign up for the free service. Then you can go in to the provided map of your neighborhood. You will be given the choice to add icons over your family’s home specifically for Halloween. There’s a candy corn you can use if you are giving out candy or a haunted house icon if you’re hosting a scary adventure and everyone is welcome to take part. 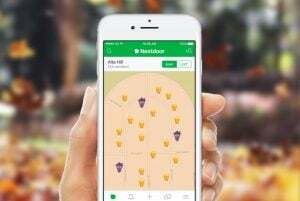 Parents can use the Treat Map, available also for iPhone and Android, to help their children plan out where they will go to trick-or-treat. There’s no need for confusion about who is providing candy and who isn’t with the old habit of leaving an outside light on. They can also use it to see what streets are offering the most candy. Teachers could use the website version of the app to have students plan out the best route to get get the most candy or the route that doesn’t require any backtracking or lost time. For Halloween, Nextdoor is a good thing! Attending multiple conferences this summer? I have been. A certain fact has come to my notice. Devices people are slipping into their backpacks and sling bags aren’t bulked up computing monsters. You know, the laptop with the seventeen inch screen. Or, the ultra-light Macbook with a weighty power supply. Instead, tablets and Chromebooks predominate. The problem most of us face, unless we use paper (synthetic or natural) and pen, we face a security challenge. We must secure on the go connections. In this blog entry, we will explore several virtual private network (VPN) solutions you will want to invest in. If the hotspot you’re using…[is] simply unsecured, hackers nearby can eavesdrop on your connection to gather useful information from your activities. Data transmitted in an unencrypted form (i.e., as plain text) may be intercepted and read by hackers with the correct knowledge and equipment. This includes data from any services which require a login protocol (Source). Wait, What About Securing Paper and Pen Notes? Keep a pocket notebook? Then you may feel you don’t need to secure your paper notes. That’s because someone would have to mug you, tear the notebook out of your hands. Yet, it’s not hard to imagine that a notebook could be lost or left behind. In that case, a synthetic paper notebook may offer a better solution. 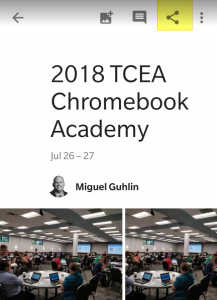 In some cases, a small paper notebook like the Rocketbook (read the TCEA blog entry, Write to Remember) may fit your needs. The Everlast Mini, shown in the video below, has me reaching for my wallet. How does it work? You can write on synthetic paper with a special pen, snap a picture of it using an app. Once the content in a synthetic paper notebook has been captured via the app on your smartphone, you can erase it. Erasure secures your data. Keep your smartphone encrypted behind a passcode, no one will be able to get into it. But you still face the challenge of securing WiFi connections in your hotel room, at a conference, or on a network lacking encryption. Resist the temptation to simply hop onto an open network. Whether in your hotel, restaurant, or conference space, protect your device with a virtual private network. Here are some quick recommendations that you can put in place. Be aware that free VPN solutions offer little protection. Online publishers like PC Mag and CNET suggest NordVPN, StrongVPN, TorGuard, and Private Internet Access (PIA) as the top-rated tools available. This video provides a simple overview of the problem we all face. I urge you to use one of these solutions when on an open, unsecured network. “What’s the best way to collect and share photos for my journalism class?” a high school journalism teacher asked me. The answer, without a second thought, was, “I’m not sure.” A few years later, a middle school journalism teacher asked me the same question. “I’m not sure. I could rig up an FTP solution. A PHP-based photo gallery would make it easy to share images via the web.” The question always arose though, “Why can’t I use Flickr?” Now, however, you can use Google Photos within the G Suites for Education to get the job done. It’s so easy. Let’s explore Google Photos as a tool for capturing and sharing images. Of course, Google Photos can do so much more. If you’re not using Google Photos to back up your photos to the cloud, you need to consider using it. Most cloud storage solutions (e.g. OneDrive, Dropbox) offer quick back up of photos to the cloud. The nice thing is that Google Photos offers unlimited storage. 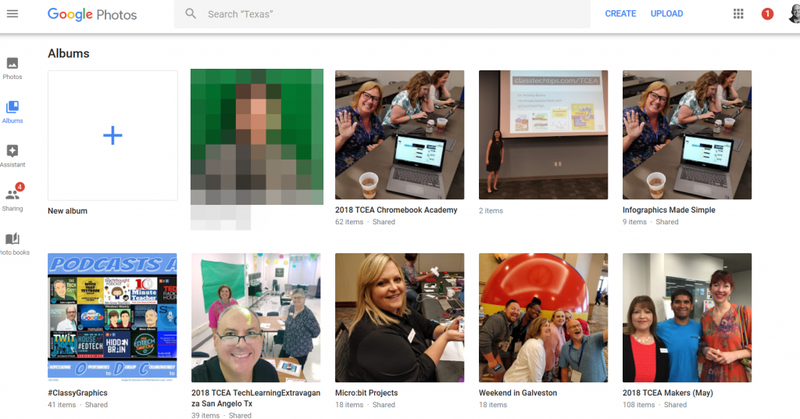 If you have a school district G Suite for Education account, then use Google Photos. It works great as a collaborative tool to back up and share pictures. Let’s explore some tips (view a detailed feature list). Ready to take school-related pictures with your personal smartphone? Let’s take a few steps to avoid confusion down the road. Note: If you are using a school-owned iPad or Android tablet, then you can ignore this tip. You need to use your G Suite for Education account on that device. First, make sure to add the Google Photos app to your smartphone. Second, log in with your G Suite for Education account. 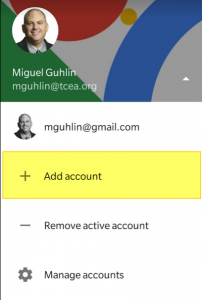 You may have to click on manage accounts to add your G Suite for Education account. You can be log in with many accounts. Clear your phone of personal images. The easiest way is to have the Photos app back up all photos you take on that device to the cloud. When the process is complete, move to step #2. Select the option to “Free up space.” This action will remove images from your phone AFTER the app backs them up. You can double-check. Go to the Google Photos app on your phone and view your images there. Still not sure? Go to http://photos.google.com and you will see your images there. 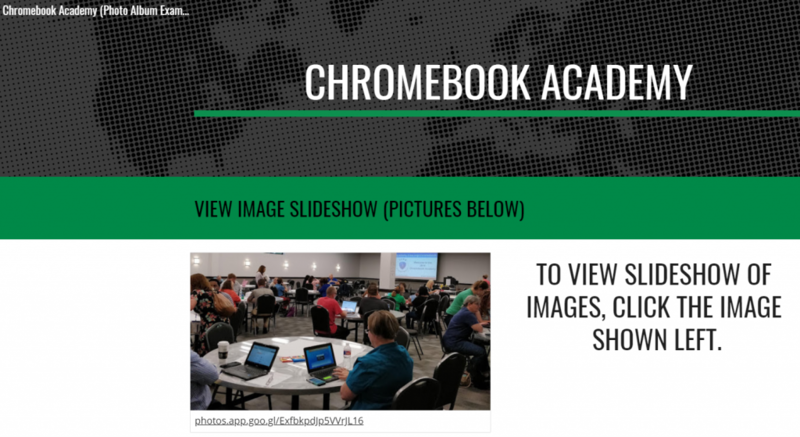 Go to the Google Photos app and log in with your G Suite for Education account. Set your G Suite for Education as the account to back up photos to. Now you are ready to take school-related pictures. All done? Let’s begin with Tip #2 below to snap pics of school events. Now that you have set your device to back up new photos to your G Suite for Education account, take lots of pictures. As you take pictures, Google Photos will back up your snapshots as bandwidth allows (e.g. WiFi). 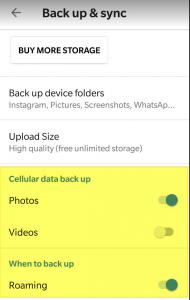 You can choose to back up pictures when you are on WiFi or using your phone’s network provider (e.g. AT&T, T-Mobile, Sprint). On the Photo app, go to “Settings” and then choose “Back up & sync”. You will see that you can turn cellular data to back up on or off. If you are capturing video, make sure to turn your smartphone or tablet sideways. This will ensure your videos will not need post-event editing. If you forget to turn your device sideways during video recording, there’s an easy fix. The Google Photos app offers the option of flipping your video sideways. How cool is that? Read Simple Video Tricks Tip #3 to learn how. 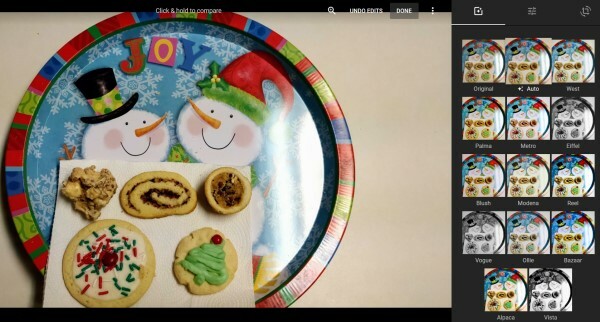 Google Photos makes editing via your web browser easy. It offers red-eye reduction, cropping, image rotation, and more. Animation – Take any series of photos and display them as an animation, like an animated GIF. You can’t change the speed of the animation like you can with GIFmaker.me. View an example of a Google Photos animation. 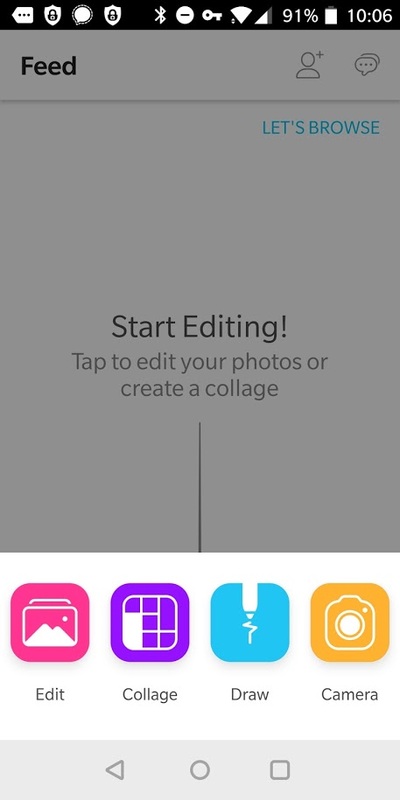 Collage – Create a simple collage of two to nine photos. Photo book – Create a printable photo book of a particular set of photos. As mentioned earlier, you can create a Shared Album in Google Photos that others can add to. Like a regular album, select the photos you want to share as an album or shared album. A shared album allows others, such as a select group of students or team members, to also add pictures. A regular album is one you create and then you can share the link to. Explore these features. One of the best aspects of Google is that you can take that link and share it. You can do that off your mobile device or online. Isn’t that amazing? On your computer, open drive.google.com. 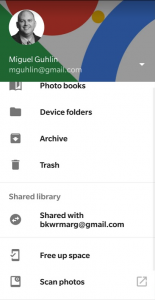 Check Create a Google Photos folder. 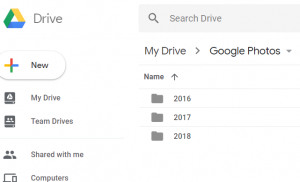 Having access to your Google Photos makes it easy for you to copy your photos to specific folders in Drive. That’s important because you can use that to organize and share the way you want to. The new Google Sites offers many great features. You can make it a virtual meeting space to showcase exciting events. 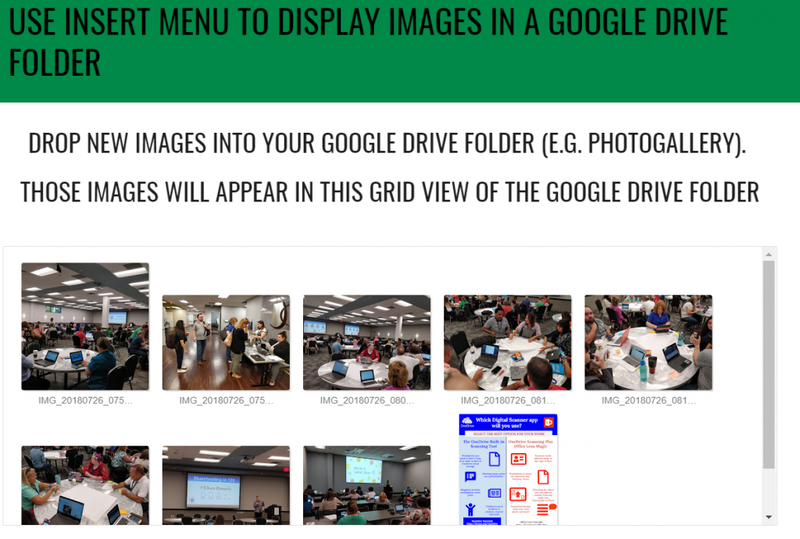 It makes embedding Google Photos in your Google Drive on a Sites web page easy. You can embed documents, videos, and images. Place animated photos into a Google Sites page. 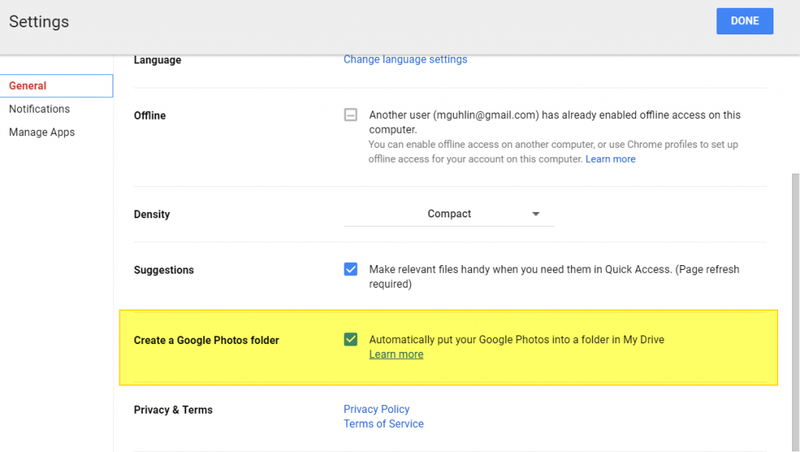 Here are two ways to view Google Photos images that are saved to Google Drive. You can view the new Google Sites setup to show these off. In this example, to view the slideshow, you must click the image shown. In this example, to view the images, you scroll down to see images. See this in action in this new Google Sites. As mentioned, Google Photos on the web offers additional features. My favorite options include auto correct on lighting, crop, and/or flip or rotate an image. Isn’t Google Photos on the web amazing? As more schools transition to the BYOD (Bring Your Own Device) model of technology use, teachers may be seeing students try to use their own inexpensive Android phones that don’t pack quite as much punch as might be needed. They may be unable to run the latest, most powerful apps, which could cause problems in the classroom. The answer to this dilemma is to “go lite” with some brand new, lite versions of Google tools that have just launched. It is small, fast, and capable. It lets you send free text messages and make voice & video calls even under limited network conditions. Small. Fast. Capable. Those three words define the lite experience. After spending some time with each, I find they are less clunky than the full app. Indeed, they are faster. This makes them perfect for any Android phone or tablet, such as Samsung and Amazon Fire, that may need apps with less of a footprint. While lite apps are available, you may also see web-based versions (such as Twitter Lite) that streamline their interface for speed. Toggle Unknown sources to On. That’s it! You are now able to access popular apps. That includes Google tools like YouTube Go, Files Go, Android Go, and, just announced, Gmail Go. In this blog entry, we’ll discuss three of the Go family. Note: If you or your students get the “No eligible devices” message, you may need to first install a no-cost virtual private network (VPN) like Windscribe or Tunnelbear. Then, change your location to an eligible country before visiting the Google Play Store. And don’t worry; the process is easier than you may think. Lets you preview videos prior to viewing. Gets videos to watch when not connected. Shares several videos with others nearby. This lightweight app may be just what you and your students’ devices need. The way Files Go works on your Android device is similar to having a personal assistant tidy things up. 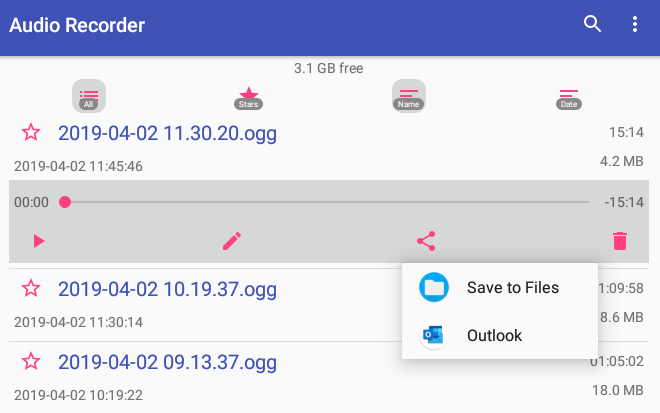 Files Go cleans up space on your Android device, keeping you organized. Ready to get your personal assistant to clean your Android phone? Use Files Go. Gmail Go blocks spam before it hits your inbox. There are many other apps that allow you or your students to go lite. Keep your eyes open for them since they can make room for more important, creative apps your students need to participate in class. Update: This blog has been updated on 4/23/2019 to reflect revised mobile VPN services. “Combinations of brightness and contrast settings can have very dramatic impact to your image, adding extra ‘punch’ or softening the visual impact,” says John Huegel in his piece, Image Editing Skills & Tools for Photographers. A Catholic school student for most of my life, I developed bad habits when it came to color matching. Dressing in simple white, blues, and/or black during your formative years may do that to you. Who would have thought uniforms might inhibit photo editing skills? Photos taken with my camera are more documentary in nature, resembling pictures of alleged UFOs in the sky. In a word, a “mess.” Manipulating photos today, though, has grown a lot easier. Let’s explore some photo editing tools on the Android platform by becoming PhotoDroids. “In June 2017, 53.3 percent of U.S. smartphone subscribers were using a Google Android device. Apple was the second most popular mobile OS with a market share of 44.9 percent,” reports Statista via their interactive graph. While some may argue that photo editing is best done on a Windows or Mac device or Chromebook, many of us snap pictures on the go. For at least fifty-three percent of us, that is an Android smartphone (iOS is second most popular with 44.9%). Some of my favorite photo backup and editing tools appear below. Give them a try, won’t you? Google Photos remains one of the top photo apps, and not just because it backs up all your photos from your smartphone to the Google cloud. Google Photos automatically turns your photos into animated slideshows. What’s more, Photos makes it easy for friends to contribute their own pics to a shared album and more. This can be a life saver for journalism students curating images in an online space. Google Photos also incorporates simple editing tools, including crop, light balance, and basic filters. Microsoft’s OneDrive also provides automatic backup of images and photo albums. Try them both out and decide which works best for you. 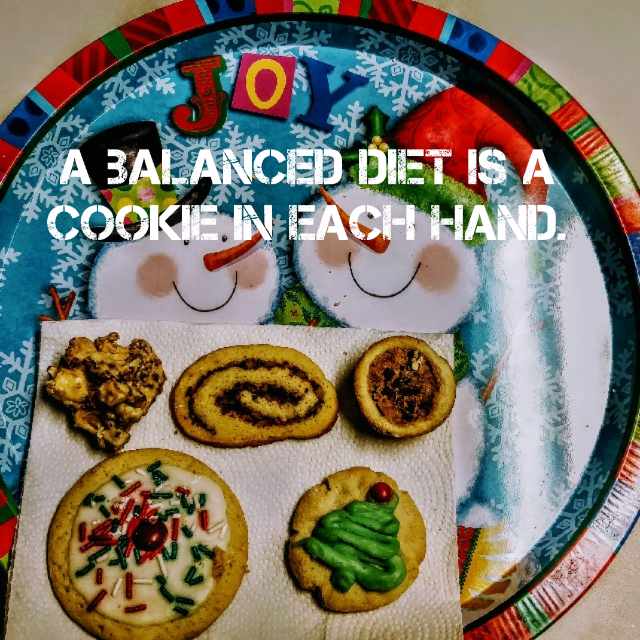 In the picture shown above, you can see a sample of the amazing holiday cookies made for TCEA staff each year by Peggy Reimers. This picture can have a baker’s dozen of special effects applied to them from within Google Photos. CameraMX serves as a nice replacement to the built-in camera app you have on your Android phone. It allows you to apply a wide variety of effects, some of which are free. Other effects will cost, but just $1.99 per collection. Effect collections include Summer Shore, Iconic Line, Famous Movie Looks, and Fun Mirrors. Each collection provides a host of effects that can enhance your photo. You need not purchase effects, though, to use many of the benefits of CameraMX. Those benefits includes geometric grain, geometric, multi-color vignette, and scratches overlays. A wide array of frames are also available. For example, in the snapshot below (captured from a television news broadcast with CameraMX), you can see several effects with frame applied. In a short time, you and your students can produce beautiful images for websites and presentations. Pictures can be shared to a variety of online spaces or remixed into another app for app-smashing purposes. PicsArt Photo Studio: Collage Maker and Pic Editor offers several features, including (per their description) “tools, effects, collage maker, camera, free clip art library, millions of user-created stickers, and our drawing tools.” This is one of the most fun apps you can start with. PicsArt Photo Studio delivers with a wealth of effects in a simple interface. But wait, there’s more! With stickers, call-outs, and more, there’s nothing cheesy you can’t do with a picture. In this image below, you can see a call-out (“Love is…”) and a heart sticker that’s been superimposed. What’s neat is you can use the built-in eraser in PicsArt to remove the contents of the heart, revealing your photo beneath the outline of the sticker. That’s simply incredible. You can also add other elements (like alien hands) to the animation. The makers of PicsArt Studio have also created Animator. It allows you to create animated GIFs, blending pictures you may have taken with animations. Per their website, PicsArt Animator includes…”duplicate frames, layers, fully equipped drawing tools, animated stickers, Emoji Me features, and much more!” Here’s a quick animation I made with a picture of the countryside viewable from a car ride. I added the sun and airplane. GifGuru: Recently, I explored creating digital image slideshows with animated GIFs. While I had identified tools for iOS and your computer, I missed GifGuru on Android. It enables you to convert a video to a sequence of images or organize images you’ve taken with your smartphone. This sequence of images is placed into an animated GIF you can share in a variety of ways, via Twitter, websites, or share them on Giphy. Giphy offers a FREE app available for both Android and/or iOS, so if 100% free animated GIFs are desirable, go with Giphy. Imagine your students creating animated GIFs about their content knowledge or a visual tutorial and then sharing it on Giphy’s website (you may need to review content before sharing it). Quote Editor: This is one of the many tools you can use to combine images with quotes. It enjoys multiple fonts, built-in quotes (in case you find yourself without words), and an easy interface. Although no Typorama, you can have a lot of fun. Less is more, after all. Endless choices can paralyze students. You can see the example shown right. Were you looking for a selfie app? Here are two you will want to explore, Microsoft Selfie and Cymera. These are two apps you will want to check out. While I’ve mentioned Microsoft Selfie before in my iPhoneography blog entry, I hope you will check out Cymera. It comes with “thousands of filters effects, collage, frames, selfie stickers and the best features for your face and body.” That’s no joke. You will want to view all the free effects and options Cymera comes with. 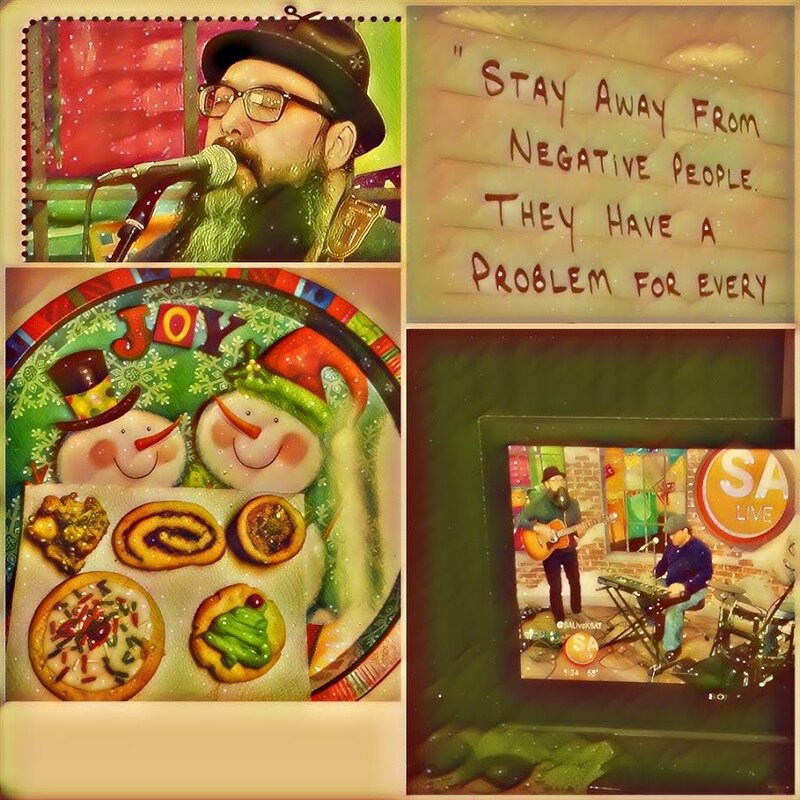 While Microsoft Selfie limits the choices (much easier), Cymera works hard to put effects at your fingertips, such as Face Pop (example shown right), Meme, Text and stickers. Helping students explore image editing and effects in an academic setting may seem like too much fun. However, the conversations about file types (e.g. JPG, PNG, GIF, animated GIF), how to share online, and how to insert images into documents meant for web or print are priceless. While students take a hit or miss approach to graphic image manipulation, direct instruction with an academic purpose can help you address those Technology Applications TEKS. These approaches range from K-3 with appropriate use of digital images to high school. “Did you know 15.2 million text messages are sent every minute?” I asked my wife at evening meal. “That’s almost as many emails as our dear daughter sent the weekend after she got a smartphone!” As we laughed to ourselves, the niggling question of who sees those communications tugged at me. How easy is it to hack SMS/text messages? I often worry someone will grab my smartphone and send text messages/emails that are inappropriate. In a previous blog entry, Safeguard Your Android, I shared how to rely on a virtual private network (VPN) to protect communications. Increasingly, you must secure your communications (e.g. email, text messages, voice calls, and where you go online). In this blog entry, we will explore how to better achieve security. 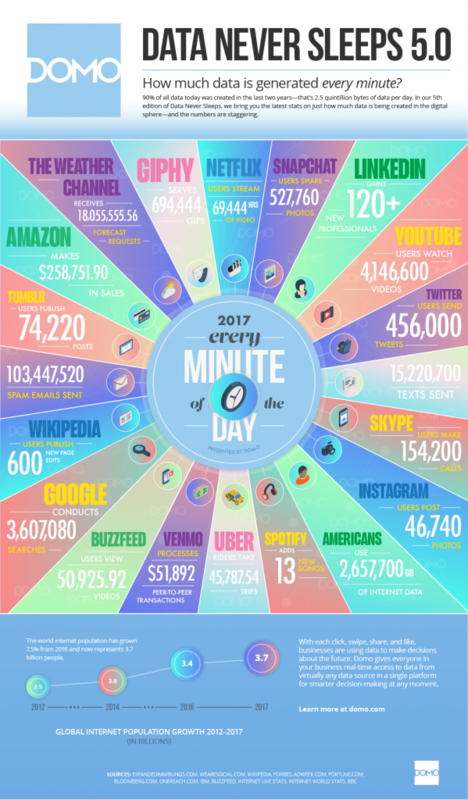 At the bottom of this blog entry, you’ll find a nifty infographic showing what sorts of data 3.7 million people put online every minute. To give you an idea, 103 million spam emails are sent every minute and 527,000 photos are shared via Snapchat. Why Do I need to Secure My Communications? You send an accidental text or email announcing that you will be at the beach this weekend. You go to the beach and post pictures on social media. When you return to your home, you realize you’ve been robbed. Tracking your movements need not result in theft. Instead, you may be the target of advertising. There are numerous ways you can be tracked on the internet. Whenever you browse the net, you are being tracked by the use of browser cookies. Whether you wish to or not, securing your communications is critical to digital citizenship. More importantly, protecting your sensitive data (and that of your students) can prevent problems before they arise. When I first began using two-factor authentication, it was a pain. I just couldn’t pick up my phone and login to Facebook or Gmail on my computer. Instead, I had to start up my Authentication app. Now, two years later, I am grateful for the added security. About six months ago, someone tried to break into my Gmail account. Without two-factor authentication, I fear I would have been hacked. If you use Google Suites, Twitter, Facebook, or Dropbox, you may find it worthwhile to protect yourself with the Google Authenticator app. You can use a site like Have I Been Pwnd? to find out if a login (your email address) has been hacked. You can also double-check to see if a password you use is up to a brute force attack with the How Secure is Your Password? website. You may also want to take an extra step. What if your phone is stolen or lost? If someone is able to make it past your fingerprint authentication, they can then use the Authenticator app to log in to your various services. On Android, it’s possible to assign a pass code to apps you choose. Even if someone has your phone unlocked in their hand, they will have to work hard to get past your pass code for individual apps. People often ask to look at my Android phone. Before, I was a little nervous about letting them look at it. Now, I can hand it over and know people will be unable to get into sensitive apps by accident. 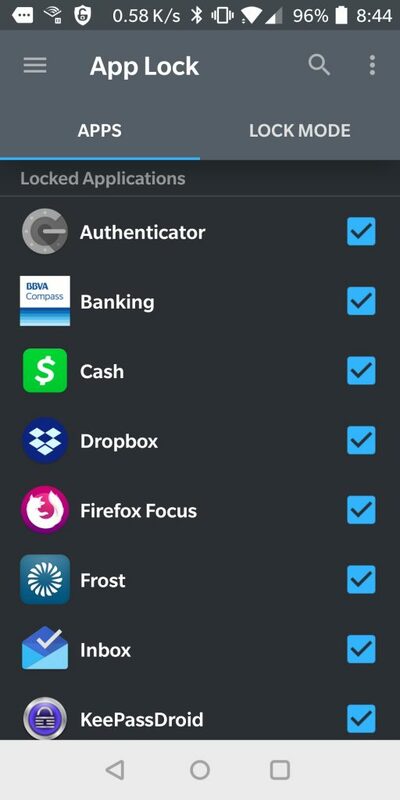 You can use BitDefender Mobile’s App Lock to assign a pass code to each app (shown above). Firefox Focus: This app works well to block cookies and advertisements. You aren’t anonymous while using it, but it works great to block ads and keep your mobile browser light. Use it with a VPN. Duck Duck Go: This search app doesn’t track your searches on the web. Use it with a VPN. Orbot: This app has a built in The Onion Router (TOR) browser, and will work to keep your internet travels anonymous as possible. Use it with a VPN to achieve higher level of protection. “What’s the username and password to Netflix?” asked my daughter a few weeks ago. Since my text messages enjoy end-to-end encryption, I have no problem sharing confidential, sensitive information via text message. However, I would never dream of doing this using the standard SMS/text message app on any device. Instead, take advantage of one of the apps below. The best one right now is Signal. On Android, you can use Signal for both encrypted and unsecured text messaging. Your friends who use Signal will connect securely with you, while others who are not using it will not. No matter what tool you use for text encryption, consider using the Secure Space Encryptor (SSE) app or website to encrypt text messages (and email). This will protect your messages with AES-256 level of encryption. “With over 200 billion emails sent and received by almost 3 billion people throughout the world each day, accessible anywhere at any time by almost anyone, email inboxes present a big target,” says JJ Rosen. You should be encrypting your email whenever possible, whether you are on your computer or your Android device. You don’t have to be a professional cryptographer to use tools like SecureGmail (Watch video), Virtru Email Encryption (Watch video) or the Paranoia Text Encryptor website. Another approach you can take is to rely on a tool like ProtonMail (based in Switzerland) or Tutanota (based in Germany). Both offer secure apps that allow you to send encrypted emails to others. For example, Protonmail comes with a pass code login. This protects strangers from accessing your email app. When composing an email, you can set a password to encrypt messages for non-ProtonMail users. You can then share the encryption password with the email recipient through a phone call or text message (not email though). When they receive the email, they use the password to decrypt your email message. What a relief to know your confidential emails are encrypted while sitting in a friend’s inbox. Another neat feature is you can set message expiration to a number of hours or days. That’s pretty amazing! Some may see these efforts to secure communications as so much cloak-and-dagger games for grownups. Let’s not forget that identity theft costs $16 billion dollars a year and affects 15.4 million people. I urge you to take every precaution possible. Only after taking proper precautions will you truly have nothing to fear. Update: This blog entry was updated with fresh links for the VPN on 4/23/2018.